On August 19, members of the People’s Guarani Assembly of Takova Mora blocked a main highway in the Chaco region of Bolivia demanding their right to free, prior and informed consent regarding oil extraction on their communal lands. The Government responded by sending in 300 police who broke up the demonstration by force. 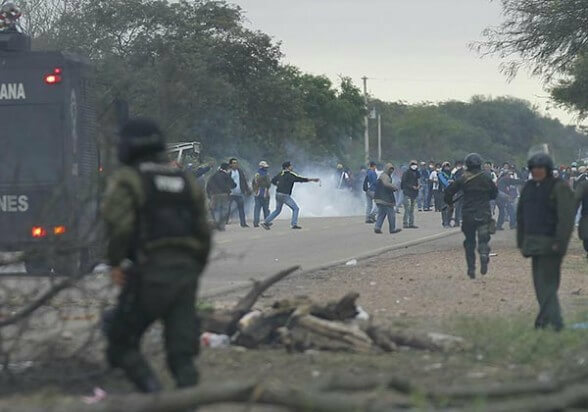 Using tear gas and batons, police then raided the nearby community of Yateirenda–where many of the demonstrators had fled–damaging property and violently arresting 27 people, including 2 youth aged 14 and 17. The behaviour of the police was more like that of mercenaries who raided the community without any arrest warrant, attacked houses and used violence to detain leaders. All 27 detainees were released the following day; however, 17 of them were given extrajudicial sanctions (medidas sustantivas) to prevent them from participating in road blocks or being involved in any events related to the Takova Mora conflict. This confrontation takes place amidst rising tensions between the Government of Evo Morales and Indigenous Peoples, environmental advocacy groups and civil society organizations critical of his extractivist policies. The first indigenous president to rule a majority indigenous country, Evo Morales took power in 2006 and is currently serving his third term in office. A cornerstone of his Government has been a series of successful redistribution programs that provide greater equality in housing, education, health, employment, and social welfare for the country’s marginalized groups. Financing these programs has depended heavily on oil and gas extraction; the land allotted to gas and oil companies has increased from 7.2 million acres in 2007 to 59.3 million in 2012. For the Morales Government, these extractivist policies are a necessary means to alleviate poverty and redistribute wealth in a way that will eventually lead to the creation of a post-extraction economy. Critics argue that these polices are short-sighted, unsustainable and damaging to Bolivia’s environmental and cultural patrimony. The dramatic decline in international oil prices in 2015 has caused an estimated 30% drop in the gas and oil income that Bolivia enjoyed in 2014. This, combined with a documented drop in the level of available gas reserves, has led to an urgent need for the Government to expand hydrocarbon frontiers. In May 2015, Supreme Decree 2366 was issued, opening up a number of protected areas and national parks to oil and gas extraction  with the provision that companies comply with “adequate” environmental measures and contribute 1% of their profit to poverty reduction and economic development in the affected region. Indigenous Peoples, whose territories coincide with those of the protected areas, are seriously concerned about the potential threat this causes to their rights and livelihoods; particularly since the Government, in another decree, amended the legal process regarding informed consent. The consultation process with affected communities now lasts no more than 45 days. “The events in Takovo Mora illustrate the authoritarian stance of Evo Morales of imposing extractivist policies and violating the rights of Indigenous People[s] as well as the rights of Mother Earth whom in the international arena he claims to defend,” said the Guarani People´s Assembly of Takovo Mora in a statement last week. An initial dialogue process between the Government and the Guarani Peoples Assembly (APG) took place on August 21; but no agreement was reached. The APG, which represents some 50,000 people in 250 communities in the lowlands of Bolivia have convened a meeting on August 29-30 for of all its members and other indigenous allies to discuss their strategy following the events in Takova Mora and Decree 2366. According to the Bolivia Information Forum Bulletin 31 the territories affected (and the percentages affected in each case) are: Iñao (90.8%), Tariquía (55%), Aguaragüe (72.5%), TIPNIS (35%), Pilón Lajas (85.5%), Madidi (75.5%), Tunari (2.03%), Apolobamba (1%), Carrasco (6.87%), Manuripi (31.16%) and Amboró (20%).